Lenovo Yoga 720 is a combination of effective processing power, featured with best graphics technology in laptops and paying respect to game lovers, Twitch streaming, e-sports, and users with a requirement of extra GPU power. A standard voltage Quad Core H Series Intel Processor is first time introduced in convertible laptops by Lenovo in Yoga 720. With characteristics of Intel Processors and PCIe SSD storage up to 256 GB, you are facilitated with lightening fast boot ups and transfer times. Onboard memory of 8G and max 16G allows you to run more apps, large files, and programs without creating hurdles in speed. The Yoga 720 offers stunning visuals to fans of convertibles by using NVIDIA® GeForce GTX 1050 discrete graphics card. Leaving behind competitors by providing such power of graphics and allowing users to edit photos, play advanced games, run multiple videos and much more. It is edged on three sides with razor thin bezels to maximize the viewing experience of users and let them allow enjoying vibrant color and detail supported with full high definition screen. It will allow users to enjoy movies and video chat clarity with a feeling of face to face meeting. Lenovo Yoga 720 is available in Platinum Silver and Iron Grey; with its sleek aluminum design, it is surely going to turn heads. Its thickness is (measured at 19mm) making a perfect combination with current active lifestyle. 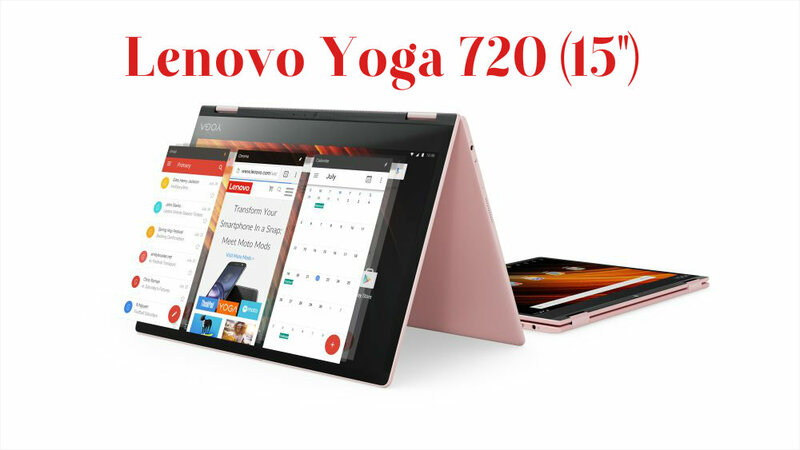 The 360-degree hinge of Yoga 720 make it something more than just a traditional laptop and allow users to switch in tablet mood to go for reading, enjoying movies and much more. It is also provided the facility of the Active Pen (Sold Separately), you can draw a sketch, send notes to a friend and do many other tasks with it. You can enjoy a natural and intuitive pen experience with astonishing pressure sensitivity, pinpoint accuracy, and palm rejection technology. It will let you know about your creativity skills.